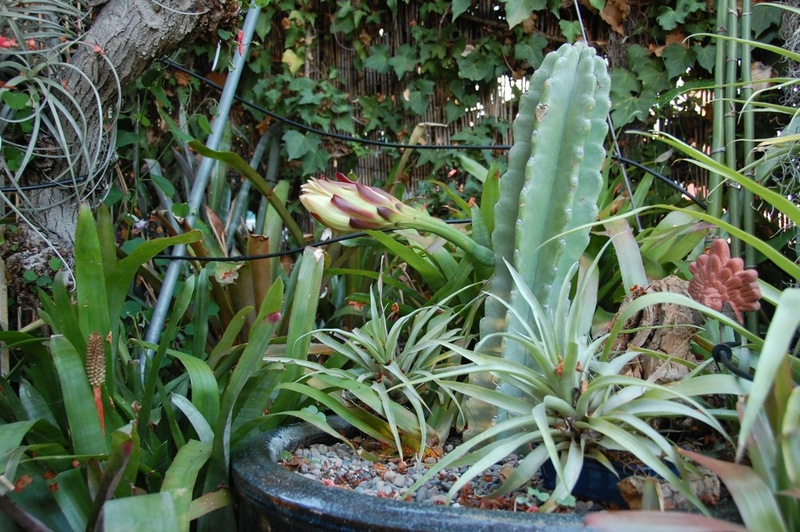 Posted on August 9, 2015	by Bill D.
We were surprised to see a flower bud because just two months earlier we had placed Peruvian Apple Cactus cuttings into large planters filled with a homemade cactus planting mix containing potting soil, coir, perlite and sand. 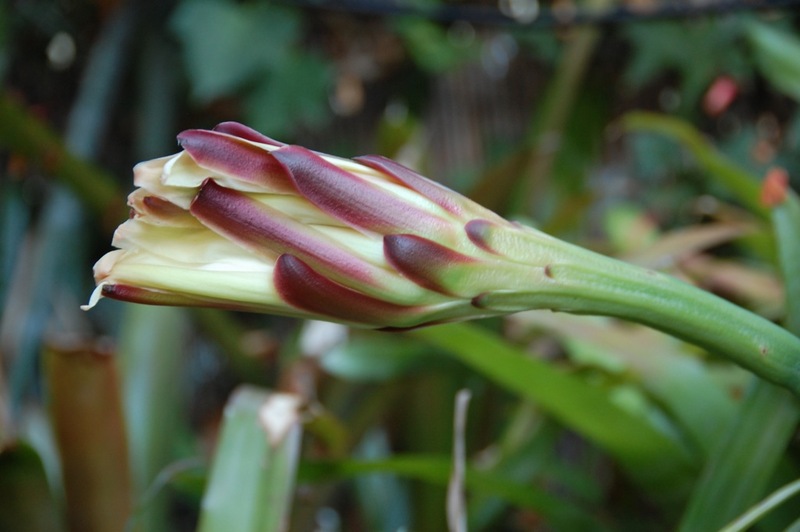 The first flower bud opening began with August’s Full Sturgeon Moon. 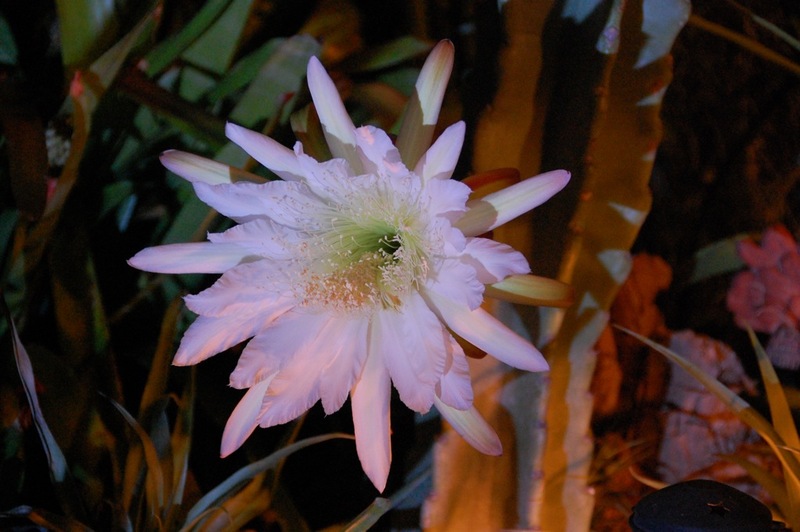 * By late afternoon, the first of its pure white inner petals could be seen. It seemed so happy and eager to surge forth and display its beauty to the world and, in particular, to the night’s moths and bats and to the morning’s bees that would hopefully come to gather pollen. At nightfall, I gathered up my tripod, headlamp, and camera to record the event. 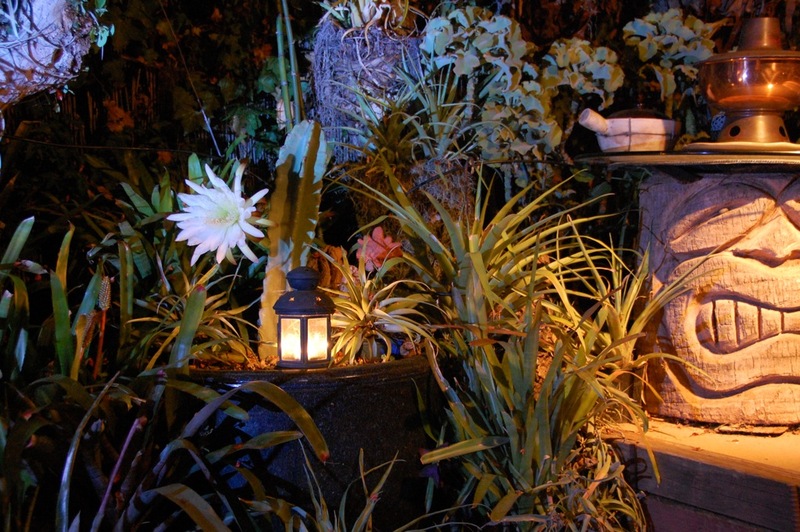 The headlamp was too bright, so I took it off, moved it away, and brought over a candle lantern that added a yellow, softer light in our backyard garden patio. It became a happy, magical moment and even the nearby tiki seemed happy to watch my antics. 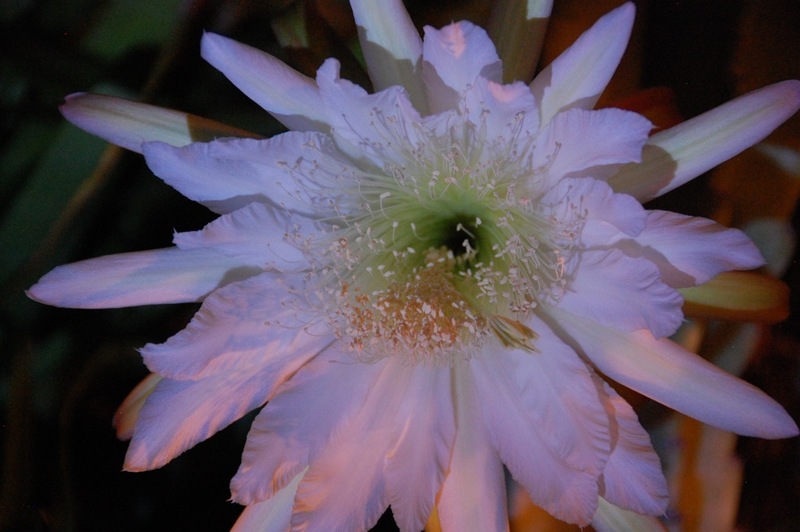 This softer combination of light helped the Peruvian Apple Cactus show off its lovely, seductive, natural beauty. Hundreds of dancing stamens holding pollen laden anthers surround the stigma seen in the lower right, which receives and transports pollen to the ovary. 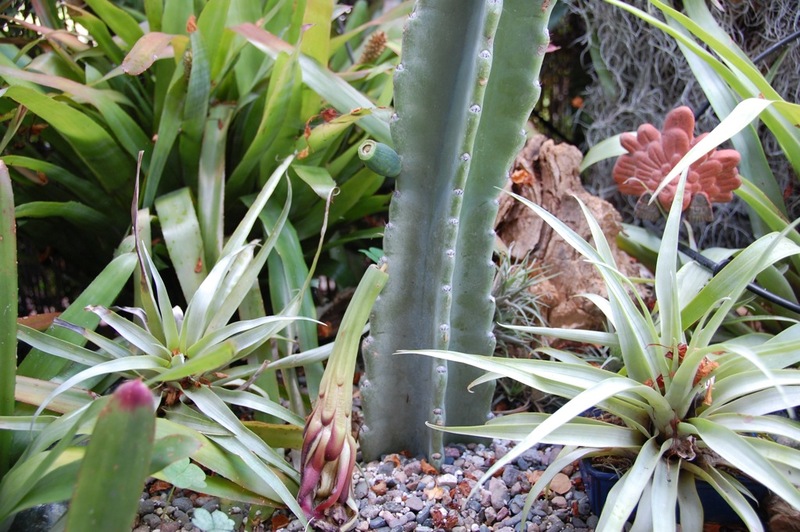 This cactus is self-fertile and to increase the chances for pollination, I used a small, soft brush to move pollen onto the stigma. Once the deed was done, I noticed that others were also here watching and smiling, such as Guan Yin, Goddess of Mercy and Compassion. 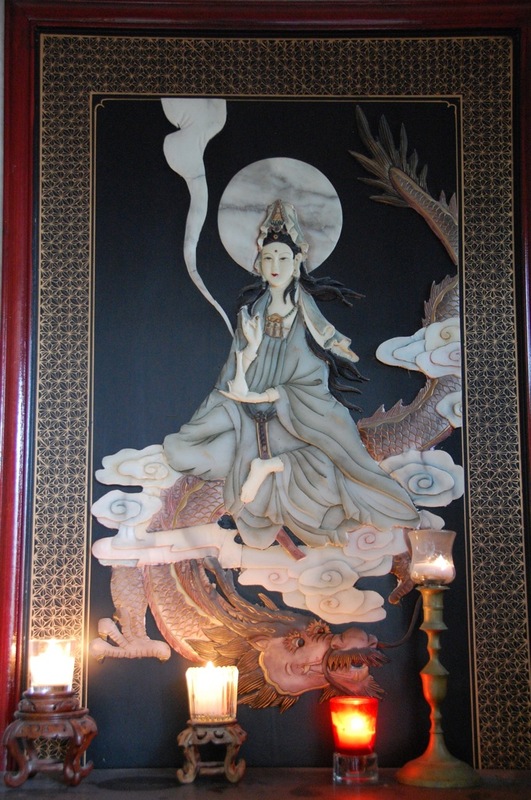 Guan Yin is often shown wearing a white, flowing robe (symbol of purity) and holding a vase of life-sustaining water. 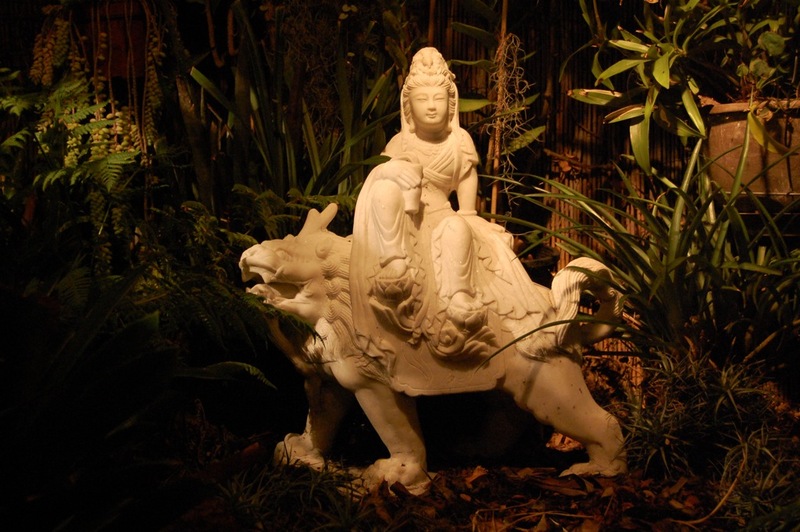 Guan Yin is seen in our garden riding on a Chinese guardian lion, and in the house, riding on a Chinese dragon. 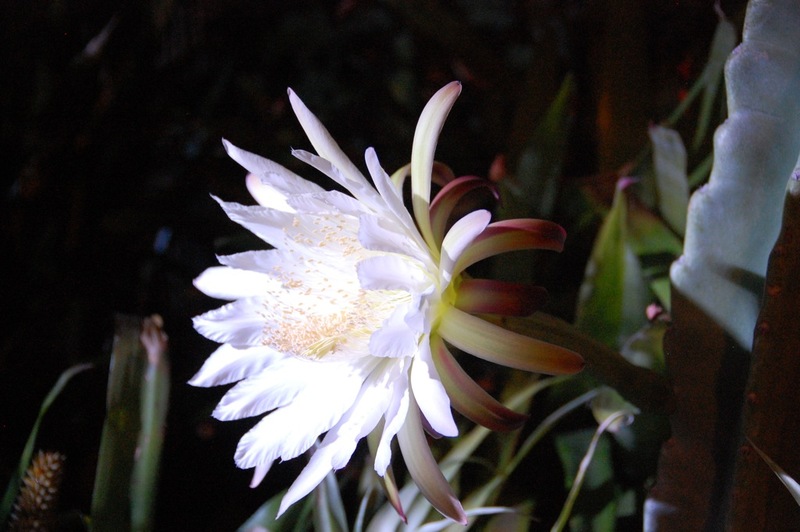 After the night’s celebration under the full moon, the exhausted flower closed in the morning. I was glad that I assisted with the flower’s pollination because no bees were seen that morning. And I was thrilled a few days later when the flower fell off and I saw the beginnings of a fruit, but saddened later in the week when the fruit fell off. 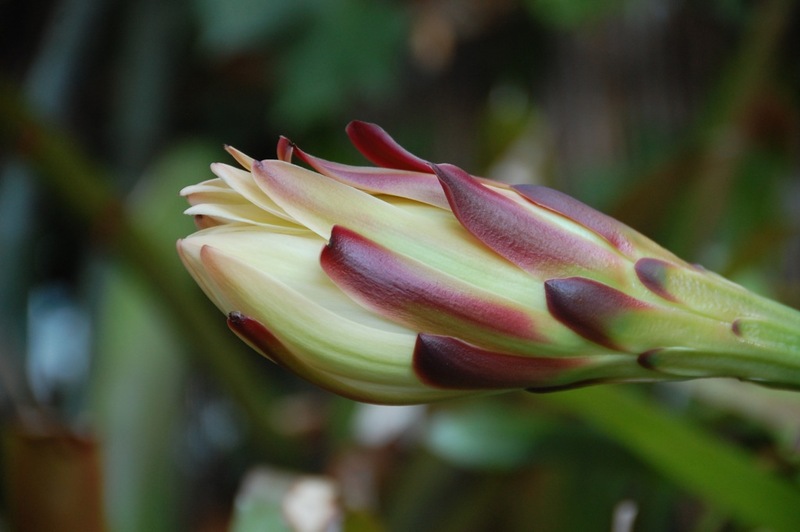 Please see my latest update in my post, “Spring flowers, leaves and end of life options,” on the progress of the End of Life Option Act, as it makes its way through the California Legislature. I am happy to report that on August 18 this legislation has been reintroduced in a special session of the California Legislature as Assembly Bill X2-15 (ABX2-15). Additional information can be seen on Compassion & Choices‘ web page. 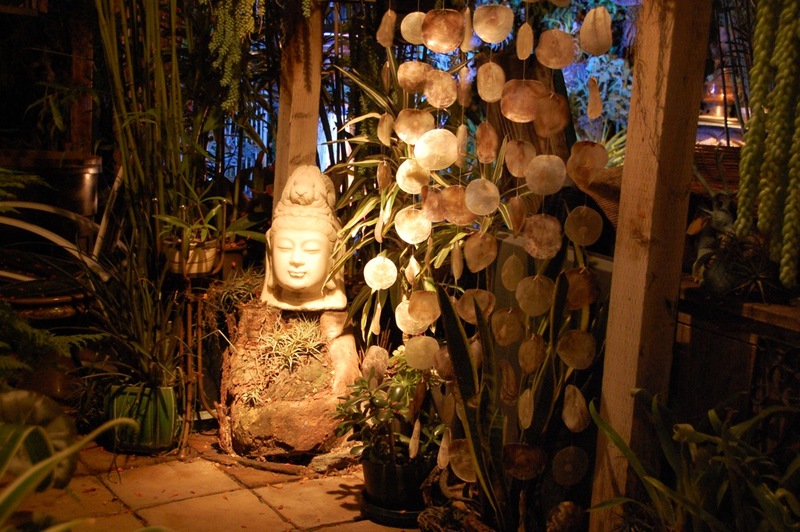 This entry was posted in Flowers, Meditations, Night photos. Bookmark the permalink.